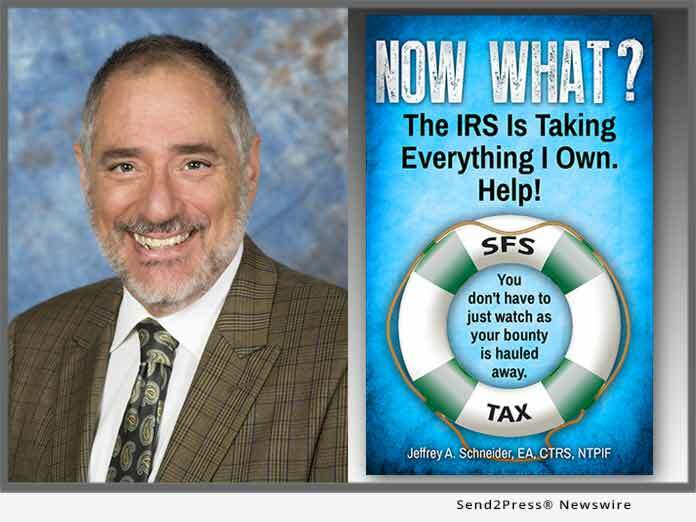 STUART, Fla., Feb 28, 2019 (SEND2PRESS NEWSWIRE) -- SFS Tax Problem Solutions Press announces the release of the second book in the Now What, Help! series, "Now What? The IRS is Taking Everything I Own. Help!" by Jeffrey Schneider, an Enrolled Agent, Certified Tax Resolution Specialist, Advanced Crypto Tax Expert and a National Tax Practice Institute Fellow. "Now What? The IRS is Taking Everything I Own. Help!" (ISBN: 978-0578409214) is available nationwide today, February 28, 2019 and is available in both e-book and paperback. In the new book, Jeffrey Schneider, EA, CTRS, ACT-W, NTPIF, explains the situations when your money can be taken by the U.S. Government and the rights they have to do it. He goes on to talk about what the taxpayer can do to prevent this situation from happening. "The Internal Revenue Service is the world's largest and most aggressive collection agency on the planet, and they will use whatever authority they have to get what they are entitled to," says Schneider. This guide discusses what can happen if one spouse is underhanded during or before a marriage and if an innocent or injured spouse has any recourse. Schneider has the knowledge and expertise to help you reach a favorable outcome with the IRS. He is the head honcho at SFS Tax & Accounting Services as well as the Enrolled Agent and Certified Tax Resolution Specialist for SFS Tax Problem Solutions. In 2018, Schneider was appointed to the Internal Revenue Service Advisory Council (IRSAC). In the book, Jeffrey demystifies what happens when the IRS or any government agency wants to take what is yours. According to Schneider, "You don't have to just watch as your bounty is hauled away, there are ways to navigate these nasty waters." Schneider explains why the IRS will take a tax return's refund, withdraw cash from your bank account, garnish your wages, social security benefits, pensions, and seize your property as well as what you can do about it. The all-encompassing advice: Tax debt is not something to ignore. "With merely a stroke of a pen, the IRS District Director is empowered to take a taxpayer's home or business," says Schneider. Title: Tax Notice Book "Now What? The IRS is Taking Everything I Own. Help!" ISBN: 978-0578409214; paperback, 6x9; 216 pp; $9.97.